The Conservation Research program at the Institute for Applied Ecology (IAE) frequently conducts research on public lands managed by the Bureau of Land Management. Our focus on rare plants often brings us to Areas of Critical Environmental Concern (ACEC). ACECs are federally designated conservation areas intended to protect the habitats of threatened and endangered species, riparian corridors, archaeological and cultural resources, and unique landscapes. 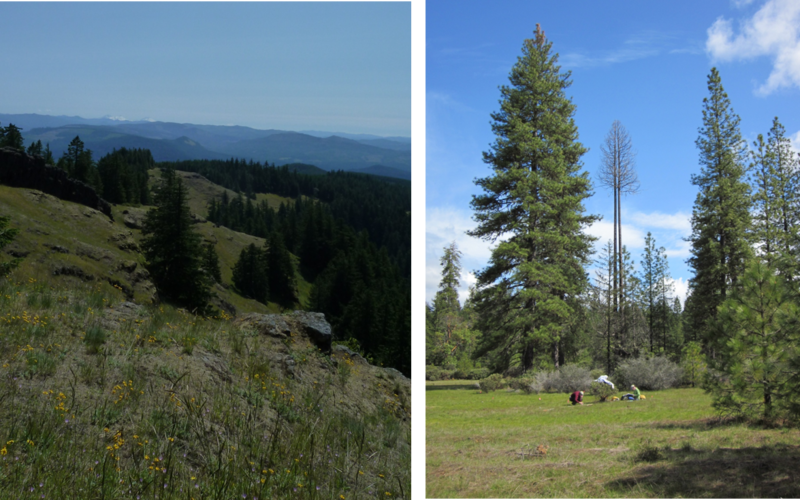 The Conservation Research program at IAE is fortunate to be able to conduct research at a number of these beautiful sites including Upper and Lower Table Rocks near Medford, French Flat near Cave Junction, and Horse Rock Ridge in the Coburg Hills. Horse Rock Ridge (left). French Flat (right). The protected status of these critical areas makes them ideal for conservation research. Protection from recreational and economic uses means that long-term monitoring and experimental plots may be established on these sites with relatively little danger of disturbance. These areas are often highly biologically diverse and harbor a variety of unique plant species and assemblages. For example Limnanthes floccosa ssp pumila (dwarf woolly meadowfoam), is endemic to Upper and Lower Table Rocks near Medford. IAE has monitored the effects of grazing and recreation on the population dynamics of Limnanthes on Table Rocks since 2006. Lomatium cookii population demography has been monitored at French Flat since 1990. Active prevention of off-road vehicle access at French Flat has helped to preserve populations of locally endemic Lomatium cookii. Horse Rock Ridge was designated an ACEC in 1984 and has been instrumental to IAE's grassland restoration research. These examples illustrate the importance of Areas of Critical Environmental Concern to conservation and scientific research.Our 2013 interns have enjoyed working in these gorgeous places and are looking forward to visiting more field sites. Dwarf wooly meadowfoam (left) monitored at Medford's Table Rocks (right). For more information on ACECs in Oregon, visit the BLM website. 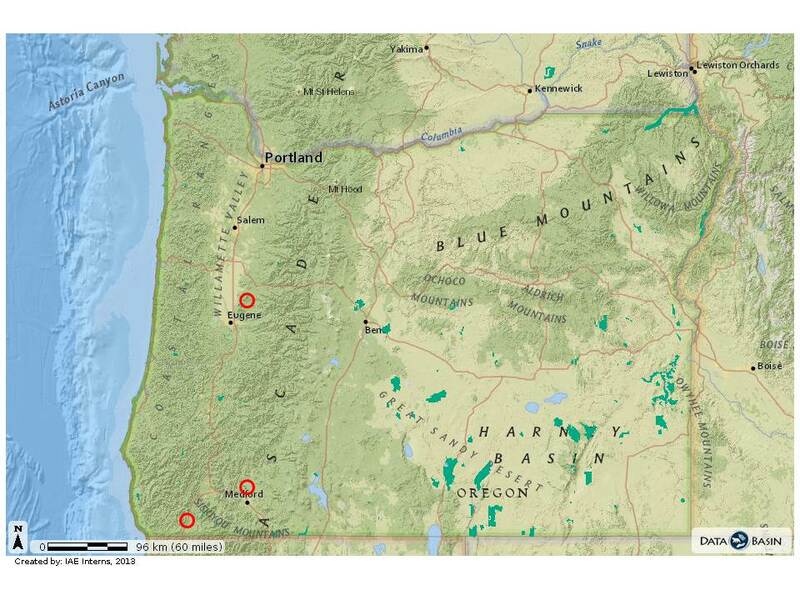 Map of ACECs in Oregon (marked in teal). Red circles indicate ACECs visited this year.